The head of the PSNI has singled out the so-called 'New IRA' as the main dissident group behind ongoing violence in Derry. Police and community leaders in the city are to meet in an effort to resolve the clashes, which have seen shots fired at police officers. Two explosive devices were thrown at officers during a sixth consecutive night of unrest in the city's Bogside, with 74 petrol bombs also thrown. Three men have been arrested, including one on suspicion of attempted murder. Riot police fired four baton rounds at rioters during the disturbances in the nationalist neighbourhood. Many of those engaging in violence were youths. 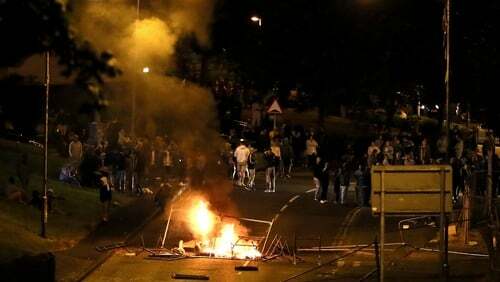 The latest night of disorder flared after the city hosted Twelfth of July Orange Order parades. At one point, a hooded rioter hurled a petrol bomb from point blank range at the windscreen of a van passing through the Bogside. PSNI Chief Constable George Hamilton said if the disorder continued it was only a matter of time before there was a fatality. During a press conference, Mr Hamilton was challenged on why police were seemingly reluctant to deploy officers into the Bogside during the rioting. Hundreds of people from across the city have turned out at a rally to protest against the violence in the Bogside area. Residents, clergy members including Bishop of Derry Donal McKeown, and politicians from across the divide turned out at Butcher Gate, the spot where police Land Rovers were attacked with petrol bombs on Thursday night. The Mayor of Derry John Boyle, SDLP leader Colm Eastwood, civil rights activist Eamon McCann and Sinn Féin's Mary Lou McDonald were all in attendance to stand in defiance of what they say is dissident republican influence exploiting vulnerable teenagers in the area. Fiachra McGuinness, son of the late former deputy first minister Martin, was also in attendance in support of his father's former neighbourhood. PSNI Superintendent Gordon McCalmont said his officers were subjected to a "prolonged and sustained attack". "I am saddened, disheartened and frustrated that yet again police officers committed to keeping this local community safe have been attacked by a small number of people within it," he said. "It is nothing short of a miracle that officers were not injured. "During this reckless disorder four AEP rounds were fired by my colleagues and we have arrested three males, aged 18 and 22 years old and aged approximately 50 years old. "The 22-year-old had been arrested for attempted murder. "While we have seen many young people involved in these attacks over the last number of nights, it is clear that this is being orchestrated by a more sinister, adult, violent dissident republican element. This cannot continue. This must end now." He appealed to community leaders to help stop the disorder. DUP leader Arlene Foster said in a tweet that political leaders have urged an end to the rioting. Sinn Féin MP for Foyle Elisha McCallion said: "This has got to end before someone gets killed." Northern Ireland Secretary Karen Bradley said the disorder was "completely unacceptable". She added: "My full support goes to the PSNI and others who are working so hard to end this intolerable violence by a small minority." On Tuesday night, a volley of machine gun fire was directed at officers and on Wednesday night two pipe bombs were thrown at police. No one was injured. Thousands of Orange Order members took part in Twelfth of July parades across Northern Ireland yesterday to mark the 1690 victory of Protestant King William of Orange over Catholic King James II at the Battle of the Boyne. It was the biggest date in the Protestant loyal order parading calendar.